Nepal- a country of Mt. Everest and the birth place of Lord Buddha. This is one of the beautiful country in south Asia. Nepal is still natural and it has so many different cultures and ethnic groups. We have unique history in the world. Nepal is not big in area and rich in economy but it has wide and well valued culture and nature. Nepal heritage tour nothing offers more than its value and property. 10 sites of Nepal are listed in world heritage sites by UNESCO. They are simply, 8 cultural monuments and 2 are natural national parks. Our aim to show all of theses places with Nepal heritage tour to all of you. Whether you are in Nepal for your business call, conferences, family holiday or enjoying retirement life. If you can mange few days we can start the tour even on short notice too. Eagle Treks & Expedition like to introduce you about Nepal and it's beauty. So, we believe that this tour will give you information about beautiful Nepal and Nepali cultures. The highlight feature of Nepal Heritage tour are visiting both natural and cultural UNESCO listed site at once. Chitwan National park a natural heritage site and Lumbini a religious monument. 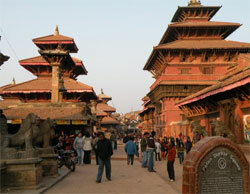 The sightseeing places in Kathmandu offers all of the UNESCO listed heritage sites. A small hillock (Tansen) in between Lumbini and Pokhara will offers the history of ancient Nepal. This small town also offers you stunning view of sunset/sunrise with massif mountains to the north. However the journey further to Pokhara has innumerable bends. We will organize this tour on overland drive basis. The vehicle will be designed according to group size either car or jeep or buses. Day 11: Final departure to international airport or further program according to your flight schedule.